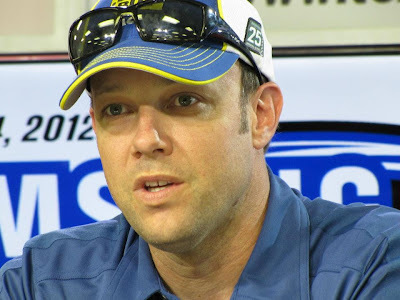 I have had opportunity to write about Matt Kenseth several times in my career. And, for the most part, I usually bemoan the fact that he is not one of my favorites. I neither hate nor dislike him, but I don’t care much for him. What frustrates me, however, is I know I am missing something. Kenseth has legions of loyal fans who are enamored with the man as a driver and in all other aspects of his life. They are members of his numerous fan clubs, follow him and his son Ross religiously, and camp out on race day to listen to his musings on the radio during the event. Being a “Roushkateer” for his entire career, Kenseth seems to get the short end of the stick when it comes to notoriety. Although he has won a Cup and two Daytona 500s, he is not often seen as the premiere driver at the Roush stable. That title was often given to the likable handsome star who flips out of the car when he wins, Carl Edwards. Edwards, however, has had a rough go of it this season and Kenseth has, once again, been a consistent force to be reckoned. He and teammate Greg Biffle swapped the points lead earlier in the season, and are both in the 2012 Chase. But even with winning the Daytona 500 to start the 2012 season and then a win during the Chase at Talladega, Kenseth is floundering in 11th place. It is a frustrating post-season for a team that is championship-caliber. Still, that’s not what is most perplexing to me. Certainly I realize Kenseth departing from Roush at season’s end was going to affect the post-season. It’s not that I’m projecting Kenseth won’t be a factor in the rest of the Chase because anything could happen, but he is battling an immense deficit. Like many who support Kenseth, I am waiting for him to land at Joe Gibbs Racing in 2013. This lame duck period at Roush is frustrating and sad. Seeing Kenseth leave Roush and Ford is a blow for many. They align the three in their mind. But I suspect the legions of Kenseth fans will follow him when he exchanges his Ford for a Toyota and his Cat in the Hat for the Coach. I’m hoping the move will ignite some spark of interest in Kenseth. He is too talented and too well-loved for me to feel apathy toward him. I want to like him. I want to root and cheer for him. I continue to research the man for articles and get impressed by him, but that doesn’t parlay into fandom. Perhaps change is just what Kenseth needs and what I need to see. When one’s world gets shaken up – in this case a driver with a long-time team leaves said team for another high-profile one – excitement dawns. Change is like that. So I’m funneling my energies into rooting for Matt Kenseth as he takes his final curtain calls with Roush in his Ford. If he can make a run on the Cup, all the more fun it will be. What I am truly looking forward to, however, is a clean slate for Kenseth at JGR. His car knowledge, experience, and championship may be the needed force they have been missing there. For Kenseth it may be the opportunity to shine brighter and perform even better. My attitude toward Kenseth has softened and my respect for him has grown. I definitely feel the end of this era and know it is bittersweet. And I also know Matt Kenseth is now yet another reason why I love NASCAR. I don't think Matt will change much just because he is going to JGR but I'll lay money on the atmosphere among the drivers at JGR changing a whole lot for the better, with poor old Diced Bread gone 'Steady Eddy' will bring some missing champions presence back to the JGR fold that will benefit both the #18 and #11. Well, that's easy. The sheer excitement and all those people cheering is more than enough for anyone to learn the basics and get behind the wheel.